This sensor detects the rotation speed of the turbine which shows the input turbine speed of the transmission. By comparing the input turbine speed signal (NT) with the output shaft speed sensor signal (SP2), the ECM detects the shift timing of the gears and appropriately controls the engine torque and hydraulic pressure according to various conditions. As a result, the gears shift smoothly. When the transmission revolution sensor (NT) input voltage is higher than 1.9 V for 4.5 seconds or more (1 trip detection logic). When the transmission revolution sensor (NT) input voltage is below 0.1 V for 4.5 seconds or more (1 trip detection logic). Output shaft speed is 1000 rpm or more. Park/neutral position switch D input signal is ON. Gear position is 2nd, 3rd, 4th, 5th or 6th. The vehicle speed is 25 km/h (15.54 mph) or more. Vehicle speed at output speed sensor is 8.99 km/h (5.59 mph) or more. (B) Transmission revolution sensor (NT) value is less than 300 rpm. The transmission revolution sensor (NT) detects the transmission input shaft speed. The ECM calculates gear shifts comparing the transmission revolution sensor (NT) with the transmission revolution sensor (SP2). While the vehicle is operating in 2nd, 3rd, 4th, 5th or 6th gear with the shift lever in D, if the input shaft speed is less than 300 rpm*1 and the output shaft speed is more than 1000 rpm*2, the ECM interprets this as a fault, illuminates the MIL and stores the DTC. *2: The vehicle speed is 25 km/h (15.54 mph) or more. P07BF and P07C0: 4.5 sec. Input the DTC: P071512, P071514 or P071531. 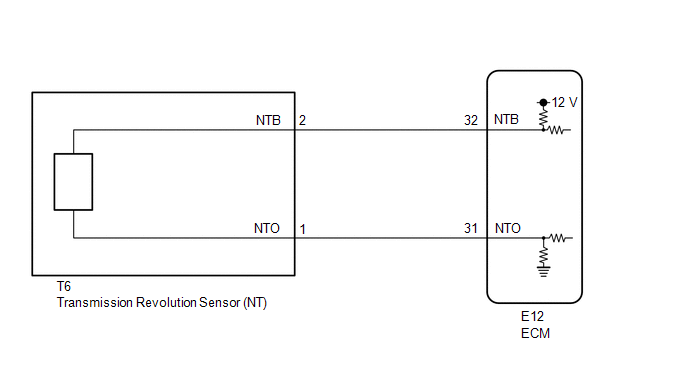 NT Sensor Speed is always 0 while driving: Open or short in the sensor or circuit. NT Sensor Speed is always more than 0 and less than 300 rpm while driving the vehicle at 25 km/h (15.54 mph) or more: Sensor trouble, improper installation, or intermittent connection trouble of the circuit. (e) In accordance with the display on the Techstream, read the Data List. (a) Remove the transmission revolution sensor (NT) (See page ). (b) Connect the battery to the sensor as shown in the illustration. (c) Wave a magnetic object left and right in front of the transmission revolution sensor (NT) tip (5 mm (0.197 in.) or less) to change the high/low signals while measuring the current. Make sure to wave the magnetic object during the inspection. The current will not change without waving the magnetic object as indicated by the arrow in the illustration. (d) Measure the current according to the value(s) in the table below. (a) Disconnect the T6 transmission revolution sensor (NT) connector. (b) Disconnect the E12 ECM connector.